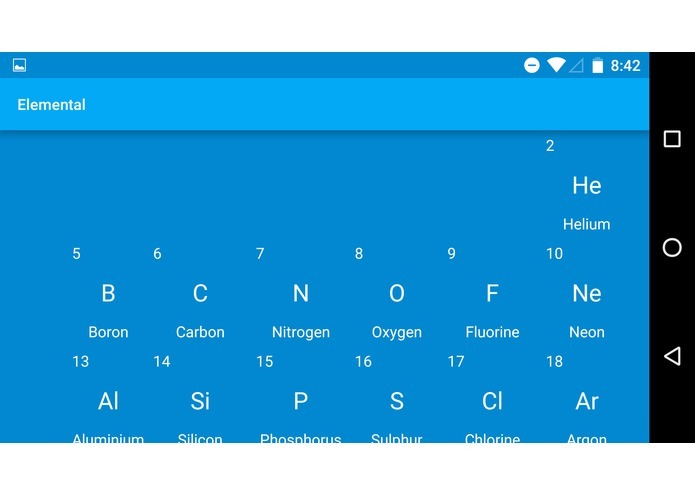 Whenever in my high school chemistry class we often have to look at our periodic table reference sheet, and I often think... Why do we have to look at the boring piece of paper all the time when we can look be looking at an app on our phone! I created two things today, an app and a single class to use as API for this data. When I was searching online I didn't find any good way to get information about apps and I figured I could make one along with my app! 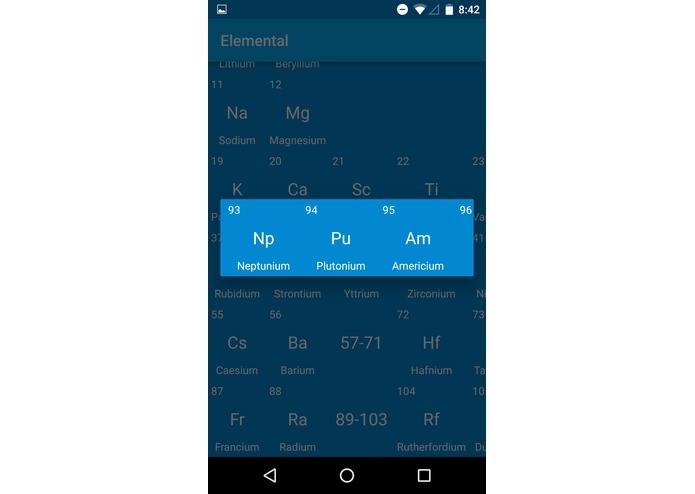 The app allows you to view the periodic table as in it's official layout including all 118 elements. 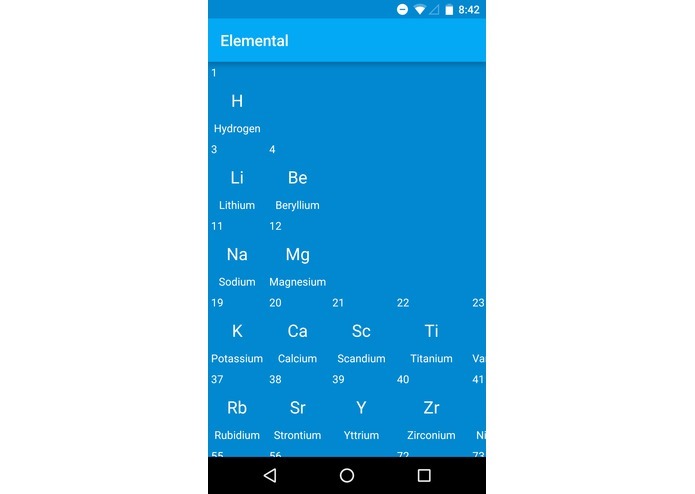 It also includes the "extra" elements that are on the periodic table. Honestly I Kent believe how well I did. There were lot's of components to this app. 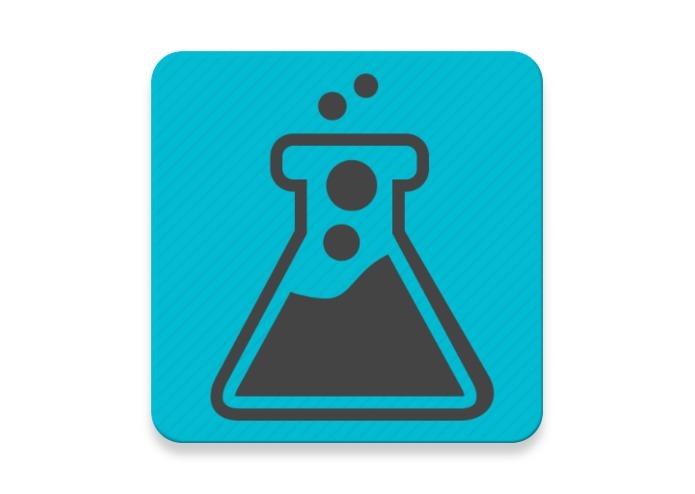 In order to get data I had to scrape many websites to get valid data about the elements. I scraped them, organized them in an Excel spreadsheet and then converted it into a CSV file (I later changed it to a pipe (|) deliminated file). After I got all the data I parsed the CSV and created functions to get different aspects of the element in my class. This would get the discoverer of the first element, Hydrogen. I ran into pleanty of challenges, they started before I even got here. The day before I came to this AMAZING hackathon the rest of my team bailed except for my one friend who did not want to drive home alone. Therefore I had to find a team at the event, from there I found a team although it was 4 in the morning and we still had no idea. I ended up splitting off to go by myself and we went on our separate projects. 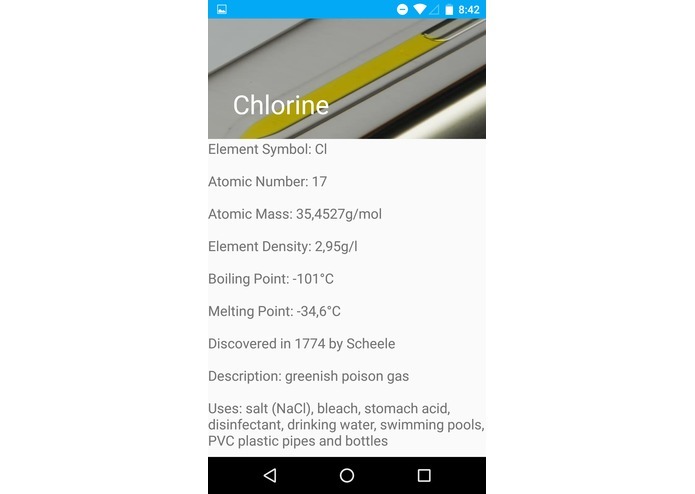 As for programming problems a big challenge was getting information, I scraped plenty of websites for information, verified all their validity and then implemented it into my app. The biggest challenge I faced was formatting all of the elements on the main page to be scaleable and in their exact position because I wanted to sure the best device comparability. I'm proud of this entire app, getting the main layout was probably my biggest accomplishments which I am proud. I had to take care of skipped spaces, extra elements, and more. I've learned so much more about Android development as well as things from other teams about hardware usage. I learned to use Myo armbands with some new friends I made :). What's next? Pleanty! I do not plan to end this app here. I plan to continue to update the design and functionality, add more information. And.... Make a web API for anyone to use!